Marriage is a milestone that has to be achieved by every girl. No matter how much you run away from it, the big day is bound to come. No matter how many darkest moments have been in your lives and how many breakups and fights you have gone through, you will have to stick on. You never know that these events may turn out to be beneficial in the long run. Amidst all the commotion of turn out to be beneficial, you often forget to focus on all the awesome things that you should do before tying the knot. I am not saying that you won’t be allowed to do those after marriage but what you enjoy doing as a spinster will be a lot different as a married women, especially in India where marriage calls for a unique bond with the spouse’s family members too. 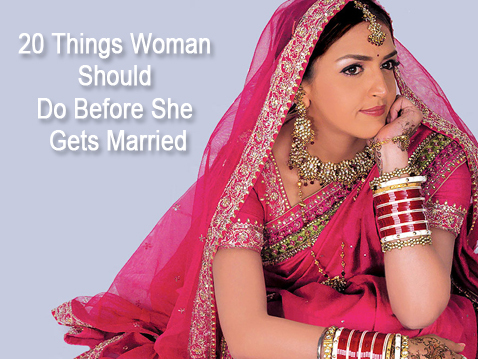 Below is the list of the top 20 things every woman should do before sitting on the mandap. Heartbreaks are literally heartbreaking. But, if you have had one in the past it will actually make you strong for the new relationship and teach you not to take the other person for granted. Travel with your would-be spouse. This way you will get to know him better and also check if you have anything in common, if his is as nuts as you. If you want to, go for it. Dump the person who made you weak. It is always empowering to be the one who called the final shot in a relationship at one time or another. Arrange your finances and set them in order. Make sure you do not carry a heavy burden of credit to your husband’s home. Try to lighten it as much as you can. Leave all by yourself or with your girlfriend for some time; no parental interference. Autonomy for sometime will prove to be a boon for you and you will enjoy your life. Do something memorable that you will cherish for lifetime. It might be stupid or naughty, but at least you will have something to reminisce about. Learn how to cook. This is something important in India. It is reassuring to know that you can fend for yourself in the kitchen. Live-in relationships are made legal in India. So, if you want to take a test drive live with your partner for a while. You will get an idea of what the future holds. Give extra importance to yourself because you deserve it. Travel to an exotic place and enjoy bit of your single life. Face one of your biggest fears like skydiving, public speaking, watching horror movies alone, etc. One big blowout fight with your future spouse won’t be a bad idea. But, do not leave it open. Sort it out. This way you will come more closure to each other. Focus on your education. Spend your pre-marital time getting degree and fulfilling your goal in life. Find what you love doing, in order words your hobby and practice it for a happy soul. Spend way too much on a something frivolous to make yourself happy. Gather your exact feeling about kids and discuss it with your partner so that you do not get hitched later on. Exorcise all past relationship demons, forgive, forget and move on. There is no valid argument for sticking on to the past. Introspect. Get to know who you are and what you exactly want from life.